Editor’s note: On Friday, December 9, we lost a great American hero with the passing of Senator John Glenn. In his memory, we are reprinting the following column that appeared in the February, 2002 edition of the Tennessee Bar Journal. It is reprinted with the permission of the Tennessee Bar Association. That was the kind of wonderful teacher Mrs. Gillespie was. She could slap down Yuri Gagarin, the lying Communists, and Benjamin The Smartest Boy in Class in one fell swoop. Before she had turned on the TV set that morning so that we could all watch John Glenn go into orbit, Mrs. Gillespie had led our class in reciting the Lord’s Prayer. She did this every morning. A few months later, in June of 1962, the United States Supreme Court ruled that Mrs. Gillespie was violating the United States Constitution when she led us in the Lord’s Prayer. Actually, Mrs. Gillespie wasn’t a defendant in the case, and I don’t believe that Chief Justice Earl Warren ever called her and told her to quit praying. But even if he did, it wouldn’t have made any difference. Mrs. Gillespie wasn’t afraid of either Communists or Supreme Court Justices. In fact, if Earl Warren or Nikita Khrushchev or Fidel Castro had ever appeared in our classroom, she probably would have spanked them right on the spot since she not only believed in the Lord’s Prayer, she also believed in corporal punishment. In her case, however, it was more like major general punishment rather than corporal punishment since Mrs. Gillespie could deliver some fairly sharp licks to an unruly fourth grader’s backside. For nearly five hours on that cold February day in 1962, I and my classmates watched Walter Cronkite as he described each successful orbit of Friendship 7 until Lieutenant Colonel Glenn splashed down safely in the Atlantic Ocean. By the end of that February day, I had a new hero. Suddenly, John Glenn ranked right up with my other icons such as Mickey Mantle, Johnny Unitas, and Ben and Adam and Little Joe and Hoss Cartwright. That night after my parents put me to bed, I pretended that my bunk bed was Friendship 7. “Boy, that was a real fireball!” I exclaimed as I fired the retrorockets on my bunk bed and hoped that the heat shield would keep me from disintegrating in flames. Well, all those wonderful memories from 1962 came back to me when Lieutenant Colonel — now — Senator John Glenn decided to do an encore. Thirty-six years after his last space flight, he once again blasted into orbit. It was one small step for man and one giant comeback for one of my childhood heroes. I hadn’t watched a NASA launch in years, But I didn’t miss this one. I even recited the Lord’s Prayer as a I watched the lift-off. 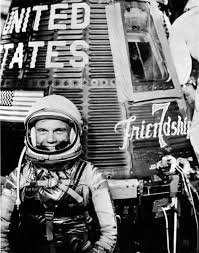 And as I wished Godspeed to John Glenn for the second time, I fondly remembered a time when I had a wonderful teacher and oh so many heroes. [url=https://www.mhrwriter.co.uk/coursework-writing-service]MHR Writer[/url]: thank you so much for giving us a chance to have this opportunity..
MHR Writer: it was a wonderful chance to visit this kind of site and I am happy to know. thank you so much for giving us a chance to have this opportunity..
college admission essay writing tips: Definitely it was a great moment not only for USA but whole world because it was never happened before, this is the reason why NASA is best in their plans, research and sacrifice to discover the world. Dejero live: Year 2013 has been quite eventful. SRSG also witnessed events and evolved in terms of business verticals, technologies, people and processes. Best MBA College in chandigarh: Now that drives everyone's attention. Good job!! A nice and informative post. Keep it up. Bart Haltom: I also remember that day, I wasn't quite 5. Brad and I were brought into watch this historic moment also by my momma. She said this is history, remember it. Always enjoyed watching those count downs and blast offs. True American Heros! buck wellford: Another great one Billy. Our generation revered the Mercury astronauts. My kids don't really get it.